Scammers are taking advantage of the confusion in the wake of Microsoft’s Operating System upgrade to trick users through phishing campaigns that install ransomware and fraudulent call centers that demand payment. Windows users, who may not have clicked on the Microsoft icon to reserve a copy of Windows 10, are being tricked into installing ransomware through massive phishing campaigns. Emails are being sent to them instructing them to click on the link, or open the attached zip file, to get their no-charge version of Windows 10. The emails inform users that this is their notification from Microsoft to upgrade and are spoofed to appear to be coming from Microsoft via update@microsoft.com (though the email header reveals that the message actually originated from an IP address in Thailand.) The emails use the Windows 10 update app’s color scheme and include a disclaimer message that looks similar to one you would receive from Microsoft. They also contain the message “This message has been scanned for viruses and dangerous content by MailScanner, and is believed to be clean.” However, clicking the link or opening the zip attachment installs CTB-Locker ransomware! CTB-Locker ransomware encrypts documents stored on your computer (and computer network) and demands a ransom paid in bitcoin to receive the encryption key. It is spread via email, exploit kits or downloads. This Windows 10 CTB-Locker campaign gives users only 96 hours to deliver payment, less time than other CTB-Locker campaigns. Other Windows users are being conned into paying fees to scammers. The scammers use call-centers, that claim to be Microsoft tech support, to call users and charge users for the upgrade using their credit card. Be wary if you do receive an email, claiming to be from Microsoft, about your Windows 10 upgrade. Do not click on the link or open the attachment to install Windows 10! Also be wary of calls that claim to be from Microsoft. The upgrade to Windows 10 is free! (That is free for qualified Windows 7 and Windows 8.1 devices.) 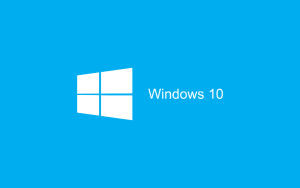 Read our Windows 10 blog post to learn about the new Operating System. The upgrade was released on July 29 and users have one year (until July 29, 2016) to get the upgrade for free. If you have a qualified device, you should see a new Windows icon on your computer. When you hover over it, you will be instructed to “reserve your free upgrade” and Microsoft will download Windows 10 to your device. If you don’t see the new Windows icon on your computer, go directly to the Microsoft website to reserve your copy. Be aware that, after you reserve your copy, it will take a few days or weeks before you will actually receive notification via the Get Windows 10 app on your desktop that your download is ready. The upgrade will be downloaded directly to your device from Microsoft. It will not be sent by email. Many users are experiencing issues with the upgrade to Windows 10. It is still a new system and Microsoft has already issued a huge (1 GB) automatic update for the initial problems. Some professionals are even recommending that users wait to install the new Operating System until Microsoft works out the bugs. Big Idea Technology can help you install Windows 10 on your computers and configure it to optimize its use for your business. Of course, our help desk is here to help our clients if you encounter any issues with the new Operating System. Call us to get started.